Q: When is the river ice safe to go on? That’s the lesson local emergency responders were teaching during school visits last week. 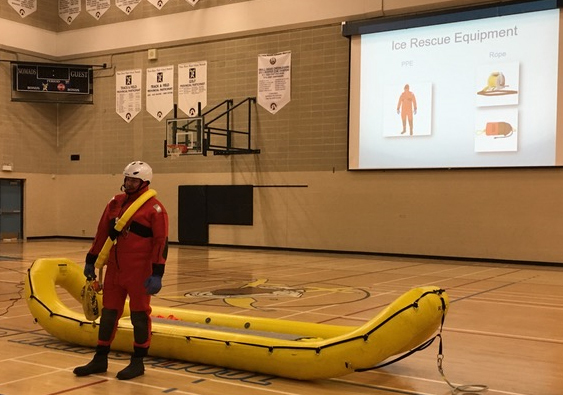 On March 31st, members of the Peace River RCMP detachment, Alberta Health Services EMS and the Peace River Fire Department presented information sessions regarding ice safety to local students. The sessions included information regarding what to expect if you fall through the ice and procedures for self-rescue, statistics on injuries and deaths related to ice and cold water, and how ice rescues are performed. The group made five presentations at TA Norris Middle School, Glenmary High School and Peace River High School. Showing off the gear used to rescue people from the river in winter. The idea for these presentations came from the Community Advisory Committee, which brings together local officials and emergency responders to address regional public safety concerns. Peace River Town Councillor Oren Ford, who is a member of the committee, was present to introduce the group. The presenters included Captain Frayne of the Peace River Fire Department, Constable Jessica Roy of the RCMP and Tyne Lunn, an Advanced Care Paramedic with Alberta Health Services EMS. Also present to assist were Lieutenant Cooper of the Peace River Fire Department and Firefighter Drew Keddie of the County of Northern Lights Fire Department. On behalf of the Peace River and County of Northern Lights Fire Department, the RCMP and Alberta Health Services – stay safe out there.